Suicide is a phenomenon that is a world health priority, with multidimensional clinical appearance and with complex biological, social and psychological risk factors. Recent studies have revealed the complexity underlying the neurobiological mechanisms of suicide. The association between genetic transmission, serotonergic system dysfunction, hypothalamic-pituitary-adrenaline axis hyperactivity, stress system, lipid metabolism, noradrenergic hyperactivity, anomaly in glial cells and signaling failure and suicidal behavior has been highlighted in particular in family, twin and adoption studies. There are also considerable evidences of morphological changes in the brain neuroimaging studies, particularly in the frontolimbic nerve and differences in the cognitive functions of the suicide attempted cases. The identification of neurobiological risk factors for suicidal behavior will play an important role in the prevention of suicide, as well as the arrangement of treatment algorithms and follow-up of treatment. The aim of this review article is to evaluate the neurobiological reasons of suicidal behavior. İntihar, karmaşık biyolojik, sosyal ve psikolojik risk faktörlerine ve çok boyutlu klinik görünüme sahip, dünya sağlık önceliği olan bir fenomendir. Son dönemde yapılan çalışmalar intiharın nörobiyolojik mekanizmalarının altında yatan karmaşıklığı ortaya çıkarmıştır. Özellikle aile, ikiz, evlat edinme çalışmalarında genetik geçiş, serotonerjik sistem disfonksiyonu, hipotalamo-pituiter-adrenaleksen hiperaktivitesi, stres sistemi, lipid metabolizması, noradrenerjik hiperaktivite, glial hücrelerde anomali ve sinyalizasyon hatası ile intihar davranışı arasındaki ilişkiye dikkat çekilmiştir. Ayrıca intihar girişiminde bulunan olguların bilişsel işlevlerinde farklılıklar olduğu, beyin nörogörüntüleme çalış-malarında özellikle frontolimbik ağda morfolojik değişiklikler bulunduğuna ait ciddi kanıtlar elde edilmiştir. İntihar davranışına ilişkin nörobiyolojik risk faktörlerinin belirlenmesi, intiharın önlenme-sinin yanısıra tedavi algoritmalarının düzenlenmesi, tedavinin izleminde önemli rol oynayacaktır. Bu yazıda intihar davranışının nörobiyolojik nedenlerinin incelenmesi amaçlanmıştır. Agerbo E, Nordentoft M, Mortensen PB (2002) Familial, psychiatric, and socioeconomic risk factors for suicide in young people: nested case-control study. BMJ, 325:74-77. Aguilar EJ, García-Martí G, Martí-Bonmatí L, Lull JJ, Moratal D, Escartí MJ et al. (2008) Left orbitofrontal and superior temporal gyrus structural changes associated to suicidal behavior in patients with schizophrenia. Prog Neuropsychopharmacol Biol Psychiatry, 32:1673–1676. Ahearn EP, Jamison KR, Steffens DC, Cassidy F, Provenzale JM, Lehman A et al. (2001) MRI correlates of suicide attempt history in unipolar depression. Biol Psychiatry, 50:266–270. Allard P, Norlén M (2001) Caudate nucleus dopamine D(2) receptors in depressed suicide victims. Neuropsychobiology, 44:70-73. Amen DG, Prunella JR, Fallon JH, Amen B, Hanks C (2009) A comparative analysis of completed suicide using high resolution brain SPECT imaging. J Neuropsychiatry Clin Neurosci, 21:430-439. Arango V, Underwood MD, Boldrini M, Tamir H, Kassir SA, Hsiung S et al. (2001) Serotonin 1A receptors, serotonin transporter binding and serotonin transporter mRNA expression in the brainstem of depressed suicide victims. Neuropsychopharmacology, 25:892-903. Arango V, Underwood MD, Mann JJ (1996) Fewer pigmented locus coeruleus neurons in suicide victims: preliminary results. Biol Psychiatry, 39:112-120. Arora RC, Meltzer HY (1989) Serotonergic measures in the brains of suicide victims: 5-HT2 binding sites in the frontal cortex of suicide victims and control subjects. Am J Psychiatry, 146:730-736. Arranz B, Blennow K, Eriksson A, Månsson JE, Marcusson J (1997) Serotonergic, noradrenergic, and dopaminergic measures in suicide brains. Biol Psychiatry, 41:1000-1009. Asberg M, Träskman L, Thorén P (1976) 5-HIAA in the cerebrospinal fluid. A biochemical suicide predictor? Arch Gen Psychiatry, 33:1193–1197. Audenaert K, Peremans K, Goethals I, van Heeringen C (2006) Functional imaging, serotonin and the suicidal brain. Acta Neurol Belg, 106:125–131. Bach-Mizrachi H, Underwood MD, Kassir SA, Bakalian MJ, Sibille E, Tamir H et al. (2006) Neuronal tryptophan hydroxylase mRNA expression in the human dorsal and median raphe nuclei: major depression and suicide. Neuropsychopharmacology, 31:814-824. Baldessarini RJ, Hennen J (2004) Genetics of Suicide: An Overview. Harv Rev Psychiatry, 12:1-13. Banki CM, Arató M, Papp Z, Kurcz M (1984) Biochemical markers in suicidal patients. Investigations with cerebrospinal fluid amine metabolites and neuroendocrine tests. J Affect Disord, 6:341-350. Besteher B, Wagner G, Koch K, Schachtzabel C, Reichenbach JR, Schlösser R et al. (2016) Pronounced prefronto-temporal cortical thinning in schizophrenia: Neuroanatomical correlate of suicidal behavior? Schizophr Res, 176:151-157. Boldrini M, Underwood MD, Mann JJ, Arango V (2005) More tryptophan hydroxylase in the brainstem dorsal raphe nucleus in depressed suicides. Brain Res, 1041:19-28. Boldrini M, Underwood MD, Mann JJ, Arango V (2008) Serotonin-1A autoreceptor binding in the dorsal raphe nucleus of depressed suicides. J Psychiatr Res, 42:433-442. Bowden C, Theodorou AE, Cheetham SC, Lowther S, Katona CL, Crompton MR et al. (1997) Dopamine D1 and D2 receptor binding sites in brain samples from depressed suicides and controls. Brain Res, 752:227-233. Brent DA, Bridge J, Johnson BA, Connolly J (1996) Suicidal behavior runs in families. A controlled family study of adolescent suicide victims. Arch Gen Psychiatry, 53:1145-1152. Brent DA, Mann JJ (2005) Family genetic studies, suicide, and suicidal behavior. Am J Med Genet C Semin Med Genet, 133:13–24. Brent DA, Melhem N (2008) Familial transmission of suicidal behavior. Psychiatr Clin North Am, 31:157-177. Brezo J, Klempan T, Turecki G (2008) The genetics of suicide: a critical review of molecular studies. Psychiatr Clin North Am, 31:179–203. Callado LF, Meana JJ, Grijalba B, Pazos A, Sastre M, García-Sevilla JA (1998) Selective increase of alpha2A-adrenoceptor agonist binding sites in brains of depressed suicide victims. J Neurochem, 70:1114-1123. Caplan R, Siddarth P, Levitt J, Gurbani S, Shields WD, Sankar R (2010) Suicidality and brain volumes in pediatric epilepsy. Epilepsy Behav, 18:286–290. Cheetham SC, Crompton MR, Katona CL, Parker SJ, Horton RW (1988) Brain GABAA/benzodiazepine binding sites and glutamic acid decarboxylase activity in depressed suicide victims. Brain Res, 460:114-123. Cheng AT, Chen THH, Chen CC, Jenkins R (2000) Psychosocial and psychiatric risk factors for suicide: Case-control psychological autopsy study. Br J Psychiatry, 177:360–365. Choudary PV, Molnar M, Evans SJ, Tomita H, Li JZ, Vawter MP et al. (2005) Altered cortical glutamatergic and GABAergic signal transmission with glial involvement in depression. Proc Natl Acad Sci USA, 102:15653-15658. Corrêa H, Duval F, Mokrani M, Bailey P, Trémeau F, Staner L et al. (2000) Macher JP. Prolactin response to D-fenfluramine and suicidal behavior in depressed patients. Psychiatry Res, 93:189-199. Cox Lippard ET, Johnston JA, Blumberg HP (2014) Neurobiological risk factors for suicide: insights from brain imaging. Am J Prev Med, 47: 152-162. Cross JA, Cheetham SC, Crompton MR, Katona CL, Horton RW (1988) Brain GABA binding sites in depressed suicide victims. Psychiatry Res, 26:119-129. Crow TJ, Cross AJ, Cooper SJ, Deakin JF, Ferrier IN, Johnson JA et al. (1984) Neurotransmitter receptors and monoamine metabolites in the brains of patients with Alzheimer-type dementia and depression, and suicides. Neuropharmacology, 23:1561-1569. Currier D, Mann JJ (2008) Stress, genes and the biology of suicidal behavior. Psychiatr Clin North Am, 31:247-269. Çuhadar İ, Koçak H (1987) Dopamin. Ondokuz Mayıs Üni. Tıp. Fak. Derg, 4:259-267. De Paermentier F, Mauger JM, Lowther S, Crompton MR, Katona CL, Horton RW (1997) Brain alpha-adrenoceptors in depressed suicides. Brain Res, 757:60-68. Desmyter S, van Heeringen C, Audenaert K (2011) Structural and functional neuroimaging studies of the suicidal brain. Prog Neuropsychopharmacol Biol Psychiatry, 35:796–808. Dombrovski AY, Siegle GJ, Szanto K, Clark L, Reynolds CF, Aizenstein H (2012) The temptation of suicide: striatal gray matter, discounting of delayed rewards, and suicide attempts in late-life depression. Psychol Med, 42:1203–1215. Dombrovski AY, Szanto K, Clark L, Reynolds CF, Siegle GJ (2013) Reward signals, attempted suicide and impulsivity in late-life depression. JAMA Psychiatry, 70:1020–1030. Duarte DGG, Neves MCL, Albuquerque MR, Turecki G, Ding Y, de Souza-Duran FL et al. (2017) Structural brain abnormalities in patients with type I bipolar disorder and suicidal behavior. Psychiatry Res, 265:9-17. Dutta R, Ball HA, Siribaddana SH, Sumathipala A, Samaraweera S, McGuffin P et al. (2017) Genetic and other risk factors for suicidal ideation and the relationship with depression. Psychol Med, 47:2438-2449. Ehrlich S, Noam GG, Lyoo IK, Kwon BJ, Clark MA, Renshaw PF (2003) Subanalysis of the location of white matter hyperintensities and their association with suicidality in children and youth. Ann NY Acad Sci, 1008:265–268. Ehrlich S, Noam GG, Lyoo IK, Kwon BJ, Clark MA, Renshaw PF (2004) White matter hyperintensities and their associations with suicidality in psychiatrically hospitalized children and adolescents. J Am Acad Child Adolesc Psychiatry, 43:770–776. Ehrlich S, Breeze JL, Hesdorffer DC, Noam GG, Hong X, Alban RL et al. (2005) White matter hyperintensities and their association with suicidality in depressed young adults. J Affect Disord, 86:281–287. Engström G, Alling C, Blennow K, Regnéll G, Träskman-Bendz L (1999) Reduced cerebrospinal HVA concentrations and HVA/5-HIAA ratios in suicide attempters. Monoamine metabolites in 120 suicide attempters and 47 controls. Eur Neuropsychopharmacol, 9:399–405. Ernst C, Mechawar N, Turecki G (2009) Suicide neurobiology. Prog Neurobiol, 89:315-333. Escribá PV, Ozaita A, García-Sevilla JA (2004) Increased mRNA expression of alpha2A-adrenoceptors, serotonin receptors and mu-opioid receptors in the brains of suicide victims. Neuropsychopharmacology, 29:1512-1521. Foster T, Gillespie K, McClelland R, Patterson C (1999) Risk factors for suicide independent of DSM-III-R Axis I disorder. Case-control psychological autopsy study in Northern Ireland. Br J Psychiatry, 175:175-179. Fu Q, Heath AC, Bucholz KK, Nelson EC, Glowinski AL, Goldberg J et al. (2002) A twin study of genetic and environmental influences on suicidality in men. Psychol Med, 32:11-24. García-Sevilla JA, Escribá PV, Ozaita A, La Harpe R, Walzer C, Eytan A et al. (1999) Up-regulation of immunolabeled alpha2A-adrenoceptors, Gi coupling proteins, and regulatory receptor kinases in the prefrontal cortex of depressed suicides. J Neurochem, 72:282-291. Giakoumatos CI, Tandon N, Shah J, Mathew IT, Brady RO, Clementz BA et al. (2013) Are structural brain abnormalities associated with suicidal behavior in patients with psychotic disorders? J Psychiatr Res, 47:1389-1395. Gifuni AJ, Ding Y, Olié E, Lawrence N, Cyprien F, Le Bars E et al. (2016) Subcortical nuclei volumes in suicidal behavior: nucleus accumbens may modulate the lethality of acts. Brain Imaging Behav, 10:96-104. Gifuni AJ, Olié E, Ding Y, Cyprien F, le Bars E, Bonafé A et al. (2017) Corpus callosum volumes in bipolar disorders and suicidal vulnerability. Psychiatry Res, 262:47-54. Glowinski AL, Bucholz KK, Nelson EC, Fu Q, Madden PA, Reich W et al. (2001) Suicide attempts in an adolescent female twin sample. J Am Acad Child Adolesc Psychiatry, 40:1300-1307. Goodman M, Hazlett EA, Avedon JB, Siever DR, Chu KW, New AS (2011) Anterior cingulate volume reduction in adolescents with borderline personality disorder and co-morbid major depression. J Psychiatr Res, 45:803–807. Gottesman II, Gould TD (2003) The endophenotype concept in psychiatry: etymology and strategic intentions. Am J Psychiatry, 160:636-645. Gross-Isseroff R, Israeli M, Biegon A (1989) Autoradiographic analysis of tritiated imipramine binding in the human brain post mortem: effects of suicide. Arch Gen Psychiatry, 46:237-241. Gross-Isseroff R, Weizman A, Fieldust SJ, Israeli M, Biegon A (2000) Unaltered alpha (2)-noradrenergic/imidazoline receptors in suicide victims: a postmortem brain autoradiographic analysis. Eur Neuropsychopharmacol, 10:265-271. Gültekin H (2005) Serotonin. Türkiye Klinikleri J İnt Med Sci 1:45-54. Hwang JP, Lee TW, Tsai SJ, Chen TJ, Yang CH, Lirng JF et al. (2010) Cortical and subcortical abnormalities in late-onset depression with history of suicide attempts investigated with MRI and voxel-based morphometry. J Geriatr Psychiatry Neurol, 23:171-184. Jeglic EL, Sharp IR, Chapman JE, Brown GK, Beck AT (2005) History of family suicide behaviors and negative problem solving in multiple suicide attempters. Arch Suicide Res, 9:135-146. Johnson BA, Brent DA, Bridge J, Connolly J, Matta J, Constantine D et al. (1998) The familial aggregation of adolescent suicide attempts. Acta Psychiatrica Scandinavica, 97:18–24. Johnstone EC, Crow TJ, Frith CD, Husband J, Kreel L (1976) Cerebral ventricular size and cognitive impairment in chronic schizophrenia. Lancet, 2:924–926. Jokinen J, Nordström AL, Nordström P (2009) Cerebrospinal fluid monoamine metabolites and suicide. Nord J Psychiatry, 63:276-279. Jollant F, Lawrence NS, Olie E, O'Daly O, Malafosse A, Courtet P et al. (2010) Decreased activation of lateral orbitofrontal cortex during risky choices under uncertainty is associated with disadvantageous decision-making and suicidal behavior. Neuroimage, 51:1275–1281. Jovev M, Garner B, Phillips L, Velakoulis D, Wood SJ, Jackson HJ et al. (2008) An MRI study of pituitary volume and parasuicidal behavior in teenagers with first-presentation borderline personality disorder. Psychiatry Res, 162:273–277. Keller S, Sarchiapone M, Zarrilli F, Tomaiuolo R, Carli V, Angrisano T et al. (2011) TrkB gene expression and DNA methylation state in Wernicke area does not associate with suicidal behavior. J Affect Disord, 135:400–404. Kim B, Oh J, Kim MK, Lee S, Tae WS, Kim CM et al. (2015) White matter alterations are associated with suicide attempt in patients with panic disorder. J Affect Disord, 175:139-146. Kim CD, Seguin M, Therrien N, Riopel G, Chawky N, Lesage AD et al. (2005) Familial aggregation of suicidal behavior: a family study of male suicide completers from the general population. Am J Psychiatry, 162:1017-1019. Korpi ER, Kleinman JE, Wyatt RJ (1988) GABA concentrations in forebrain areas of suicide victims. Biol Psychiatry, 23:109-114. Lester D (1995) The concentration of neurotransmitter metabolites in the cerebrospinal fluid of suicidal individuals: a meta-analysis. Pharmacopsychiatry, 28:45-50. Lindström MB, Ryding E, Bosson P, Ahnlide JA, Rosén I, Träskman-Bendz L (2004) Impulsivity related to brain serotonin transporter binding capacity in suicide attempters. Eur Neuropsychopharmacol, 14:295-300. Lopez OL, Becker JT, Reynolds III CF, Jungreis CA, Weinman S, DeKosky ST (1997) Psychiatric correlates of MR deep white matter lesions in probable Alzheimer's disease. J Neuropsychiatry Clin Neurosci, 9:246–250. Lowther S, De Paermentier F, Cheetham SC, Crompton MR, Katona CL, Horton RW (1997) 5-HT1A receptor binding sites in post-mortem brain samples from depressed suicides and controls. J Affect Disord, 42:199-207. Macdonald RL, Olsen RW (1994) GABAA receptor channels. Annu Rev Neurosci, 17:569-602. Malone KM, Corbitt EM, Li S, Mann JJ (1996) Prolactin response to fenfluramine and suicide attempt lethality in major depression. Br J Psychiatry, 168:324-329. Malone KM, Ellis SP, Currier D, John Mann J (2007) Platelet 5-HT2A receptor subresponsivity and lethality of attempted suicide in depressed in-patients. Int J Neuropsychopharmacol, 10:335-343. Mann JJ, Huang YY, Underwood MD, Kassir SA, Oppenheim S, Kelly TM et al. (2000) A serotonin transporter gene promoter polymorphism (5-HTTLPR) and prefrontal cortical binding in major depression and suicide. Arch Gen Psychiatry, 57:729-738. Mann JJ, McBride PA, Malone KM, DeMeo M, Keilp J (1995) Blunted serotonergic responsivity in depressed inpatients. Neuropsychopharmacology, 13:53-64. Mann JJ, Stanley M, McBride PA, McEwen BS (1986) Increased serotonin2 and beta-adrenergic receptor binding in the frontal cortices of suicide victims. Arch Gen Psychiatry, 43:954-959. Matsuo K, Nielsen N, Nicoletti MA, Hatch JP, Monkul ES, Watanabe Y et al. (2010) Anterior genu corpus callosum and impulsivity in suicidal patients with bipolar disorder. Neurosci Lett, 469:75–80. McGuffin P, Marusic A, Farmer A (2001) What can psychiatric genetics offer suicidology? Crisis, 22:61–65. Meana JJ, Barturen F, García-Sevilla JA (1992) Alpha 2-adrenoceptors in the brain of suicide victims: increased receptor density associated with major depression. Biol Psychiatry, 31:471-490. Merali Z, Du L, Hrdina P, Palkovits M, Faludi G, Poulter MO et al. (2004) Dysregulation in the suicide brain: mRNA expression of corticotropin releasing hormone receptors and GABA(A) receptor subunits in frontal cortical brain region. J Neurosci, 24:1478-1485. Mirkovic B, Laurent C, Podlipski MA, Frebourg T, Cohen D, Gerardin P (2016) Genetic association studies of suicidal behavior: A review of the past 10 years, progress, limitations, and future directions. Front Psychiatry, 23:158. Mittendorfer-Rutz E, Rasmussen F, Wasserman D (2008) Familial clustering of suicidal behaviour and psychopathology in young suicide attempters. A register-based nested case control study. Soc Psychiatry Psychiatr Epidemiol, 43:28-36. Monkul ES, Hatch JP, Nicoletti MA, Spence S, Brambilla P, Lacerda AL et al. (2007) Fronto– limbic brain structures in suicidal and non-suicidal female patients with major depressive disorder. Mol Psychiatry, 12:360–366. Ohmori T, Arora RC, Meltzer HY (1992) Serotonergic measures in suicide brain: the concentration of 5-HIAA, HVA, and tryptophan in frontal cortex of suicide victims. Biol Psychiatry, 32:57-71. Olié E, Ding Y, Le Bars E, de Champfleur NM, Mura T, Bonafé A et al. (2015) Processing of decision-making and social threat in patients with history of suicidal attempt: A neuroimaging replication study. Psychiatry Res, 234:369-377. Oquendo MA, Galfalvy H, Sullivan GM, Miller JM, Milak MM, Sublette ME et al. (2016) Positron Emission Tomographic Imaging of the Serotonergic System and Prediction of Risk and Lethality of Future Suicidal Behavior. JAMA Psychiatry, 73:1048-1055. Oquendo MA, Placidi GP, Malone KM, Campbell C, Keilp J, Brodsky B et al. (2003) Positron emission tomography of regional brain metabolic responses to a serotonergic challenge and lethality of suicide attempts in major depression. Arch Gen Psychiatry, 60:14–22. Oquendo MA, Sullivan GM, Sudol K, Baca-Garcia E, Stanley BH, Sublette ME et al. (2014) Toward a Biosignature for Suicide. Am J Psychiatry, 171:1259-1277. Ordway GA, Widdowson PS, Smith KS, Halaris A. (1994) Agonist binding to alpha 2-adrenoceptors is elevated in the locus coeruleus from victims of suicide. J Neurochem, 63:617-624. Öncü B (2016) İntihar ve İntiharda Risk Etmenleri. Türkiye Klinikleri J Psychiatry-Special Topics, 9:1-15. Özalp E (2009) İntihar davranışının genetiği. Türk Psikiyatri Dergisi, 20:85-93. Pandey GN, Pandey SC, Dwivedi Y, Sharma RP, Janicak PG, Davis JM (1995) Platelet serotonin-2A receptors: a potential biological marker for suicidal behavior. Am J Psychiatry, 152:850–855. Pandey GN (2013) Biological basis of suicide and suicidal behavior. Bipolar Disord, 15:524-541. Pan LA, Hassel S, Segreti AM, Nau SA, Brent DA, Phillips ML (2013) Differential patterns of activity and functional connectivity in emotion processing neural circuitry to angry and happy faces in adolescents with and without suicide attempt. Psychol Med, 43:2129–2142. Perroud N, Neidhart E, Petit B, Vessaz M, Laforge T, Relecom C et al. (2010) Simultaneous analysis of serotonin transporter, tryptophan hydroxylase 1 and 2 gene expression in the ventral prefrontal cortex of suicide victims. Am J Med Genet B Neuropsychiatr Genet, 153:909-918. Petersen L, Sorensen TI, Kragh Andersen P, Mortensen PB, Hawton K (2014) Genetic and familial environmental effects on suicide attempts: A study of Danish adoptees and their biological and adoptive siblings. J Affect Disord, 155:273-277. Pitchot W, Hansenne M, Gonzalez Moreno A, Pinto E, Reggers J, Fuchs S et al. (2001b) Reduced dopamine function in depressed patients is related to suicidal behavior but not its lethality. Psychoneuroendocrinology, 26:689-696. Pitchot W, Reggers J, Pinto E, Hansenne M, Fuchs S, Pirard S et al. (2001a) Reduced dopaminergic activity in depressed suicides. Psychoneuroendocrinology, 26:331-335. Plomin R, Reiss D, Hetherington EM, Howe GW (1994) Nature and nurture: genetic contributions to measures of the family environment. Dev. Psychol, 30:32-43. Pompili M, Innamorati M, Mann JJ, Oquendo MA, Lester D, Del Casale A et al. (2008) Periventricular white matter hyperintensities as predictors of suicide attempts in bipolar disorders and unipolar depression. Prog Neuropsychopharmacol Biol Psychiatry, 32:1501–1507. Poulter MO, Du L, Zhurov V, Palkovits M, Faludi G, Merali Z et al. (2010) Altered Organization of GABA(A) Receptor mRNA Expression in the Depressed Suicide Brain. Front Mol Neurosci, 29(3):3. Powell J, Geddes J, Deeks J, Goldacre M, Hawton K (2000) Suicide in psychiatric hospital in-patients. Risk factors and their predictive power. Br J Psychiatry, 176:266-272. Qin P, Agerbo E, Mortensen PB (2003) Suicide risk in relation to socioeconomic, demographic, psychiatric, and familial factors: a national register-based study of all suicides in Denmark, 1981-1997. Am J Psychiatry, 160:765-77. Richard-Devantoy S, Ding Y, Lepage M, Turecki G, Jollant F (2016) Cognitive inhibition in depression and suicidal behavior: a neuroimaging study. Psychol Med, 46:933-944. Roggenbach J, Müller-Oerlinghausen B, Franke L, Uebelhack R, Blank S, Ahrens B (2007) Peripheral serotonergic markers in acutely suicidal patients. 1. Comparison of serotonergic platelet measures between suicidal individuals, nonsuicidal patients with major depression and healthy subjects. J Neural Transm (Vienna), 114:479-487. Roy A, Segal NL (2001) Suicidal behavior in twins: a replication. J Affect Disord, 66:71-74. Roy A, Segal NL, Sarchiapone M (1995) Attempted suicide among living co-twins of twin suicide victims. Am J Psychiatry, 152:1075-1076. Runeson B, Asberg M (2003) Family history of suicide among suicide victims. Am J Psychiatry, 160:1525-1526. Rüsch N, Spoletini I, Wilke M, Martinotti G, Bria P, Trequattrini A et al. (2008) Inferior frontal white matter volume and suicidality in schizophrenia. Psychiatry Res, 164:206–214. Ryding E, Ahnlide JA, Lindström M, Rosén I, Träskman-Bendz L (2006) Regional brain serotonin and dopamine transporter binding capacity in suicide attempters relate to impulsiveness and mental energy. Psychiatry Res, 148:195-203. Sachs-Ericsson N, Hames JL, Joiner TE, Corsentino E, Rushing NC, Palmer E et al. (2014) Differences between suicide attempters and nonattempters in depressed older patients: depression severity, white-matter lesions, and cognitive functioning. Am J Geriatr Psychiatry, 22:75–85. Schlegel S, Maier W, Philipp M, Aldenhoff JB, Heuser I, Kretzschmar K et al. (1989) Computed tomography in depression: association between ventricular size and psychopathology. Psychiatry Res, 29:221–230. Serafini G, Pompili M, Innamorati M, Fusar-Poli P, Akiskal HS, Rihmer Z et al. (2011) Affective temperamental profiles are associated with white matter hyperintensity and suicidal risk in patients with mood disorders. J Affect Disord, 129:47–55. Soloff P, Nutche J, Goradia D, Diwadkar V (2008) Structural brain abnormalities in borderline personality disorder: a voxel-based morphometry study. Psychiatry Res, 164:223–236. Soloff PH, Kelly TM, Strotmeyer SJ, Malone KM, Mann JJ (2003) Impulsivity, gender, and response to fenfluramine challenge in borderline personality disorder. Psychiatry Res, 119:11–24. Sorenson SB, Rutter CM (1991) Transgenerational patterns of suicide attempt. J Consult Clin Psychol, 59:861–866. Spreux-Varoquaux O, Alvarez JC, Berlin I, Batista G, Despierre PG, Gilton A et al. (2001) Differential abnormalities in plasma 5-HIAA and platelet serotonin concentrations in violent suicide attempters: relationships with impulsivity and depression. Life Sci, 69:647-657. Statham DJ, Heath AC, Madden PA, Bucholz KK, Bierut L, Dinwiddie SH et al. (1998) Suicidal behaviour: an epidemiological and genetic study. Psychol Med, 28:839-855. Träskman-Bendz L, Alling C, Alsén M, Regnéll G, Simonsson P, Ohman R (1993) The role of monoamines in suicidal behavior. Acta Psychiatr Scand Suppl, 371:45-47. Tsai SJ, Hong CJ, Liou YJ (2011) Recent molecular genetic studies and methodological issues in suicide research. Prog Neuropsychopharmacol Biol Psychiatry, 35:809-817. Tsai SY, Kuo CJ, Chen CC, Lee HC (2002) Risk factors for completed suicide in bipolar disorder. J Clin Psychiatry, 63:469-476. Tsuang MT (1983) Risk of suicide in the relatives of schizophrenics, manics, depressives, and controls. J Clin Psychiatry, 44:396–400. Tsujii N, Mikawa W, Tsujimoto E, Adachi T, Niwa A, Ono H et al. (2017) Reduced left precentral regional responses in patients with major depressive disorder and history of suicide attempts. PLoS One 12(4): e0175249. Turecki G, Brière R, Dewar K, Antonetti T, Lesage AD, Séguin M et al. (1999) Prediction of level of serotonin 2A receptor binding by serotonin receptor 2A genetic variation in postmortem brain samples from subjects who did or did not commit suicide. Am J Psychiatry, 156:1456-1458. Tyano S, Zalsman G, Ofek H, Blum I, Apter A, Wolovik L et al. (2006) Plasma serotonin levels and suicidal behavior in adolescents. Eur Neuropsychopharmacol, 16:49-57. Underwood MD, Mann JJ, Arango V (2004) Serotonergic and noradrenergic neurobiology of alcoholic suicide. Alcohol Clin Exp Res, 28(suppl 5):57S-69S. Wender PH, Kety SS, Rosenthal D, Schulsinger F, Ortmann J, Lunde I (1986) Psychiatric disorders in the biological and adoptive families of adopted individuals with affective disorders. Arch Gen Psychiatry, 43:923-929. Van Heeringen K, Bijttebier S, Desmyter S, Vervaet M, Baeken C (2014) Is there a neuroanatomical basis of the vulnerability to suicidal behavior? Acoordinate-based meta analysis of structural and functional MRI studies. Front Hum Neurosci, 8:824. Voracek M, Loibl LM (2007) Genetics of suicide: a systematic review of twin studies, Wien Klin Wochenschr, 119:463-475. Yurgelun-Todd DA, Bueler CE, McGlade EC, Churchwell JC, Brenner LA, Lopez-Larson MP (2011) Neuroimaging correlates of traumatic brain injury and suicidal behavior. J Head Trauma Rehabil, 26:276–289. Zalsman G (2010) Timing is critical: Gene, environment and timing interactions in genetics of suicide in children and adolescents. Eur Psychiatry 25:284–286. Zhu H, Karolewicz B, Nail E, Stockmeier CA, Szebeni K, Ordway GA (2006) Normal [3H] flunitrazepam binding to GABAA receptors in the locus coeruleus in major depression and suicide. Brain Res, 1125:138-146. 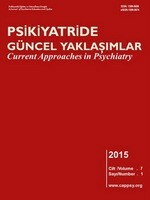 Psikiyatride Güncel Yaklaşımlar - Current Approaches in Psychiatry is licensed under a Creative Commons Attribution-NonCommercial-NoDerivatives 4.0 International License.